Luma keys provide a way to composite a foreground clip over a background clip based on the luminance levels in the video. This is most often useful for still images, such as a picture of a logo over a black background, or computer-generated graphics. 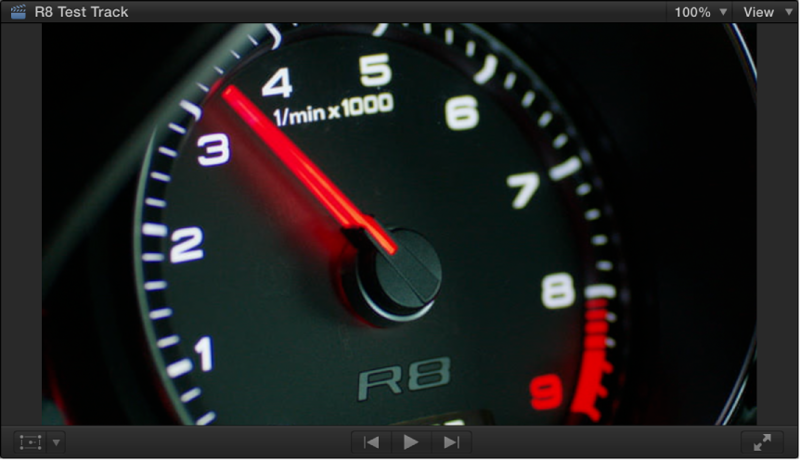 For the following examples, this speedometer image will be keyed over an outdoor car scene, creating a reflected look. In the Timeline, move the playhead to the point in the background clip (the clip you want to superimpose the luma key clip over) where you want the key to start. In the Browser, select the part of the foreground clip (the luma key clip with the black or white you want to remove) you want to key over the background, and choose Edit > Connect to Primary Storyline (or press Q). For details about connecting clips in this way, see Connect clips to add cutaway shots, titles, and synchronized sound effects. Select the foreground clip in the Timeline, and click the Effects button in the toolbar (or press Command-5). In the Effects Browser, select the Luma Keyer effect. Tip: Type “keyer” in the Effects Browser’s search field to quickly find the Luma Keyer effect. 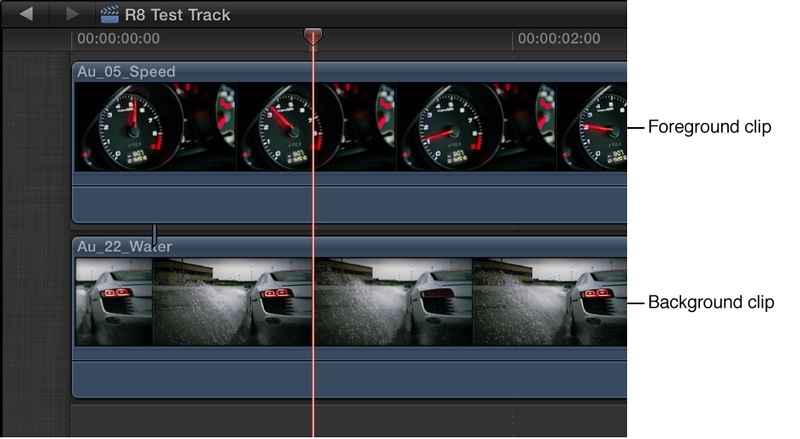 Drag the effect to the Timeline foreground clip to which you want to apply it. Double-click the effect thumbnail to apply it to the selected clip. The Luma Keyer effect automatically configures itself to remove black video. If the resulting key is not right or you would like to improve it, you can adjust the luma key effect. The following steps assume you have applied the Luma Keyer effect. In the Timeline, select the clip with the Luma Keyer effect. The Effects section of the Video inspector shows the parameters available for adjusting the Luma Keyer effect. To reverse the key and remove white instead of black areas of the foreground clip, select Invert. To adjust the white and black clip values, drag the handles at either end of the gradient thumbnail image. By default, these handles are set to provide a linear key where the luma level linearly controls the transparency of the foreground—100% white is fully opaque, 0% black is completely transparent, and 25% gray retains 25% of the foreground image. Dragging the white and black controls changes the values that result in fully opaque or fully transparent foreground video. To adjust the softness of the edges, adjust the Luma Rolloff control. Higher values make the edges harder, removing any partial transparency, while lower values take advantage of any anti-aliasing or softness the edges might have. 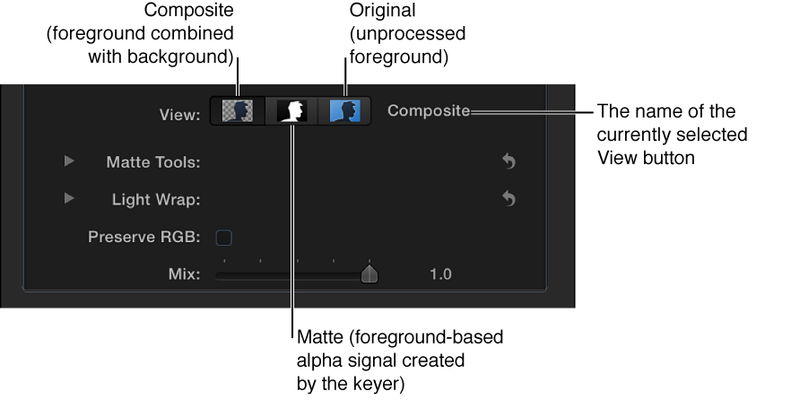 Matte: Shows the grayscale matte, or alpha channel, that’s being generated by the keying operation. White areas are solid, black areas are transparent, and varying shades of gray indicate varying levels of transparency. Viewing the alpha channel makes it easier to spot unwanted holes in the key or areas that aren’t transparent enough. Original: Shows the original, unkeyed image. To leave smoothly aliased text or graphics in the image visually intact, which can improve the edges, select Preserve RGB. For information about making advanced luma key adjustments, see the following instructions. Light Wrap: These controls are for blending color and lightness values from the background layer of your composite with the keyed foreground layer. Using these controls, you can simulate the interaction of environmental lighting with the keyed subject, making it appear as if background light wraps around the edges of a subject. The following steps assume you have applied the luma key effect. Fill Holes: Increasing this parameter value adds solidity to regions of marginal transparency within a key. This control is useful when you’re satisfied with the edges of your key, but you have unwanted holes in the interior that you can’t eliminate via the Luma Rolloff parameter without ruining your edges. Edge Distance: Lets you adjust how close to the edge of your keyed subject the effect of the Fill Holes parameter gets. Reducing this parameter value brings the filled area of the matte closer to the edge of the subject, sacrificing translucency at the edges. Raising this parameter value pushes the filled area of the matte farther from the edge, potentially introducing regions of unwanted translucency within parts of the subject that should be solid. Levels: Use this grayscale gradient to alter the contrast of the keyed matte, by dragging three handles that set the black point, white point, and bias (distribution of gray values between the black point and white point). Adjusting the contrast of a matte can be useful for manipulating translucent areas of the key to make them more solid (by lowering the white point) or more translucent (by raising the black point). Dragging the Bias handle right erodes translucent regions of the key, while dragging the Bias handle left makes translucent regions of the key more solid. Black, White, Bias: Click the disclosure triangle in the Levels row to reveal sliders for the Black, White, and Bias parameters. 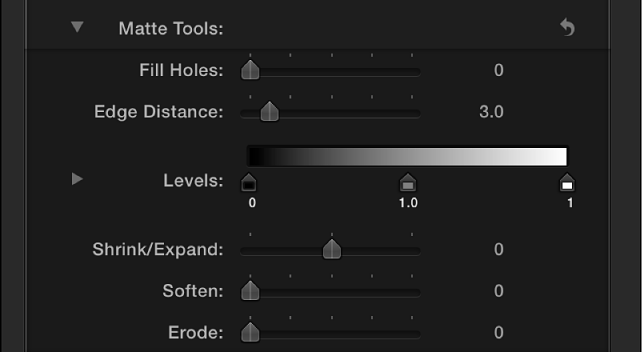 These sliders, which mirror the settings of the Levels handles described above, allow you to keyframe the three Levels parameters (via the Add Keyframe button to the right of each slider). Keyframing the Black, White, and Bias parameters may yield a better key, one that adapts to changing blue-screen or green-screen conditions. Lighten: Compares overlapping pixels from the foreground and background layers, and then preserves the lighter of the two. Good for creating a selective light wrap effect. Screen: Superimposes lighter portions of the background layer over wrapped areas of the keyed foreground layer. Good for creating an aggressive light wrap effect.